To extend the life of the existing TPO membrane. 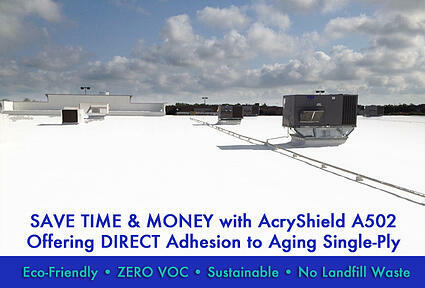 Install a coating system that does not require a costly tear-off. Opportunity to reinforce trouble spots like drains, penetrations and waterways with polyester reinforcing fabric. The system added many more years of service life to the existing roof membrane. 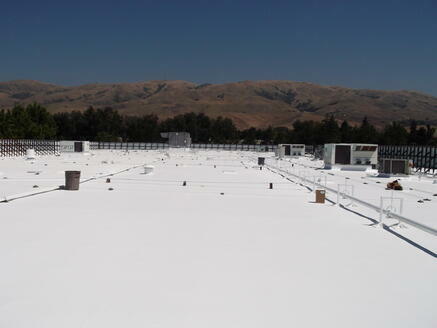 "One of our best jobs for the year was on Westinghouse Drive in Fremont, CA where we restored an old TPO roof system. The building owner was convinced he needed to tear off the old TPO system and install a new one. National Coatings was able to provide us with case studies demonstrating that a restored TPO roof would result in a more robust and less expensive roof system. The AcryShield A502 had perfect adhesion to the failing TPO. We also avoided the exposure of a torn off roof on a 93,000 square foot building. Thanks so much to Tom Absher (NCC Sales Rep) and Missy DeLaTorre (NCC Customer Service and Business Development Manager)!" - Scott Siemer, President of Just Leaks, Inc.
National Coatings has the unique ability to address the difficulties and failures that aged single-ply roofing experiences. Most roof coatings require caustic primers, acid etching agents, or high VOC solvents that need to be rinsed off and sometimes collected for disposal, adding additional cost to a roof life extension project. NCC's products have the unique ability to coat to single-ply roofing membranes without the need to use any of these harmful products. Our state of the art single-ply coating systems adhere directly to single-ply substrates providing a monolithic membrane without any of the seams that can be prone to failure. Coating restorations do no count as a new roof under most building codes, eliminating the need for periodic and costly tear-off's. This process allows for a truly sustainable roofing system by performing coating maintenance every 10 years. What's our secret? The AcryShield® A502 base coat! This single-ply base coat is the industry leader, ultra low VOC, high performance base coat for hard to coat surfaces such as Hypalon®, TPO, EPDM, and PVC roofing. 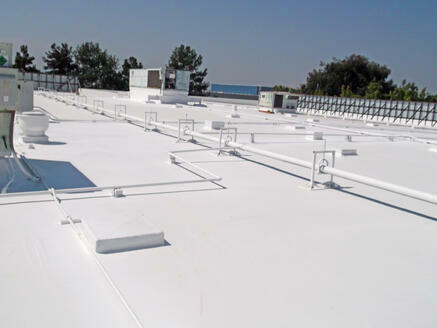 A502 base coat eliminates the need for costly roof replacement and provides unique AcryLock technology to tenaciously adhere directly to EPDM, TPO and Hypalon without the need for additional primers or an etching rinse. 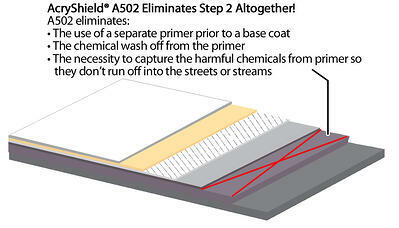 A502 also provides an additional layer of waterproofing, superior adhesion, and resistance to ponded water. Can an Elastomeric Coating Save my Leaking TPO Roof? Elastomeric coating systems are ideal for restoring and renewing aged and failing TPO roofs. These roof coating systems allow you to avoid a costly and timely roof tear off, while achieving a highly reflective, watertight, energy efficient roof. TPO roofing is originally installed by welding the seams of the rolled out TPO to one another. These seams can cause roof failures and water penetration if the installation was not done correctly and/or after these seams have weathered. Over time, the seams lose their ability to expand and contract with the rest of the roof causing rips and tears, eventually leading to a leaking roof - prompting building owners to look for a cost-effective solution. Although TPO has been notorious for being difficult to coat over, the AcryShield A502 adheres directly to TPO with tenacious adhesion and extremely low levels of harmful VOC solvents. 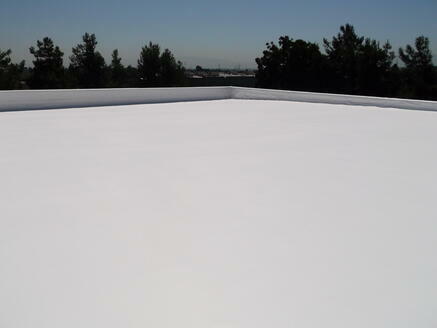 This elastomeric coating is ideal for TPO roofing because it eliminates the use of a separate primer prior to the installation of a base coat. Most roof coating manufacturers require a primer or etching rinse to be applied prior to a base coat. The application of primers and etching rinses generally entail the application, the chemical wash-off, and the capturing of the harmful chemicals before they run off into streets and streams. This additional primer step increases cost and lengthens the installation time frame. Using the AcryShield A502 base coat, contractors can quickly install your new roof coating system with direct adhesion to the TPO roof – saving the building owner time and money. For additional information on our TPO AcryPly Roofing System, download our free brochure or for information on our TPO AcryShield Roof Management System, download that brochure, here.